Nimble yet spacious, the 2019 CX-5 exhibits a refined athleticism that lets you confidently navigate your world. Its tenacious and predictive available i-Activ technology gives you the power to enjoy the well-appointed interior and advanced infotainment system while keeping your focus fixed on the road ahead. With its demanding stance and striking design, the 2019 CX-5 is a one-of-a-kind compact SUV with a presence that’s hard to ignore. Pfaff Mazda encourages you to schedule a test drive in a 2019 Mazda CX-5 today! The well-appointed interior of the CX-5 offers an available 10-way power-adjustable driver’s seat, and available automatic dual-zone climate controls to make your drive as comfortable as possible. With available rear heated seats and front ventilated seats, standard USB ports and available air vents, your passengers will love the ride as much as you do. We focused on creating a quieter ride by significantly reducing the transmission of noise generated by tires as well as wind, especially at highway speeds, so you can fully enjoy conversation, music and more. To take an already generously equipped vehicle to the next level, we gave it a 2.5 L turbocharged engine, Nappa leather-trimmed upholstery, Black interior roof lining, LED interior lighting, Abachi wood trimming and 19” alloy gunmetal wheels. Every curve and contour of the 2019 CX-5 is infused with the soul of its maker under the principles of our Kodo “Soul of Motion” Design. A marriage between timeless Japanese craftsmanship and groundbreaking innovation, the CX-5 is as much a pleasure to look at as it is to drive. But it’s not just about appearances; with intuitive functionality and striking agility, the CX-5 was designed to maximize driving enjoyment. Our Pfaff Mazda dealership in London is home to some very high quality new and pre-owned Mazda vehicles. 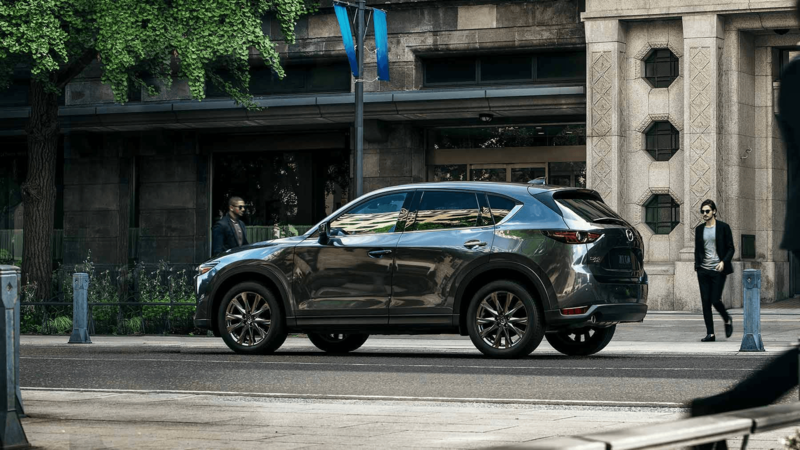 If you are looking for a 2019 Mazda CX-5 in your area, we encourage you to schedule a test drive on our website or by contacting our associates today! Click here to find our contact information or to fill out our contact form.